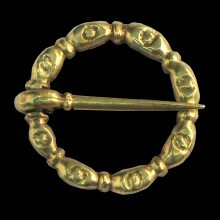 Brooch made ​​of cast brass and finished with hand-hammered brass pin and hardened. Outside diameter 3.2 cm, internal diameter 2.3 cm. Dated the thirteenth century. 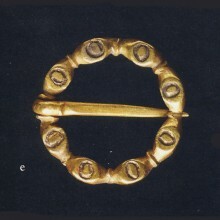 This brooch was drawn from a number of pins found on the beach in Tyre, Lebanon dating from the twelfth to thirteenth century and had spread throughout the European contingent. Literature: Taburet 1989, pp 223-224.